Renowned biochemist Xiaoqi Liu, Ph.D., has been named chair of the University of Kentucky Department of Toxicology and Cancer Biology. 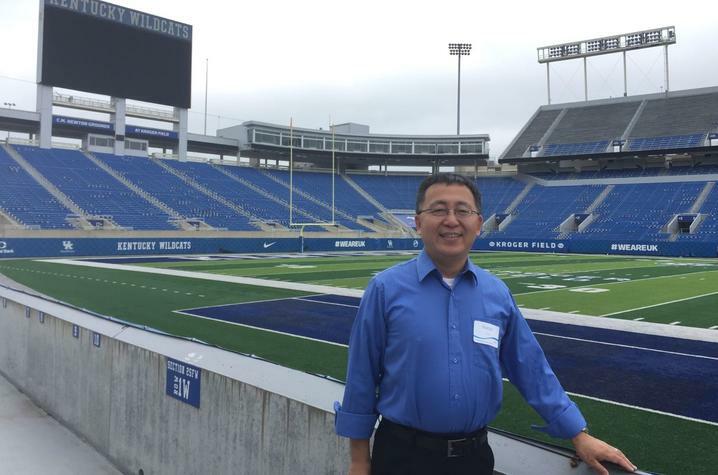 LEXINGTON, Ky. (Oct. 25, 2018) – Renowned biochemist Xiaoqi Liu, Ph.D., has been named chair of the University of Kentucky Department of Toxicology and Cancer Biology. Liu’s research involves the molecular mechanisms that cause cancer with the goal of using this information to create new avenues for cancer therapy. His work specifically focuses on an enzyme known as Polo-like kinase 1, which plays a central role in controlling cell division and exists at abnormally high levels in many types of cancers, including prostate, pancreatic, melanoma and lung cancers. Liu brings with him five active grants from the National Institutes of Health representing close to $1 million in annual direct costs. As part of the UK Markey Cancer Center, Liu’s lab will be moving into UK’s brand new $265 million research building that opened in September 2018. In 1998, Liu earned a doctorate in biochemistry from Washington State University in Pullman, Wa., followed by a postdoctoral fellowship in the Department of Molecular and Cellular Biology at Harvard University. In 2006, he became a faculty member of Purdue University’s Department of Biochemistry and Center for Cancer Research in West Lafayette, In. Immediately prior to arriving at UK, Liu was a full professor of biochemistry and served as the leader of Purdue’s Cell Identity and Signaling Program.